The other day I was talking to some colleagues in the pub (as one does). At one point the subject of conversation turned to the pressure we academics are under these days to collaborate more with the world of industry and commerce. 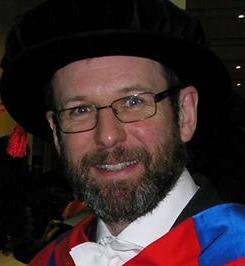 That’s one of the things that the Cardiff University Data Innovation Research Institute – which currently pays half my wages – is supposed to do, but there was general consternation when I mentioned that I have in the past spent quite a long time working in industry. I am, after all, Professor of Theoretical Astrophysics. Of what possible interest could that be to industry? My time in industry was spent at one of the research stations of British Gas, called the On-Line Inspection Centre (“OLIC”) which was situated in Cramlington, Northumberland. I started work there in 1981, just after I’d finished my A-levels and the Cambridge Entrance Examination and I worked there for about 9 months, before leaving to start my undergraduate course in 1982. At that time British Gas was still state-owned, and one of the consequences of that was that I had to sign the Official Secrets Act when I joined the staff. Among other things that forbade me from making “unauthorized disclosures” of what I was working on for thirty years. I feel comfortable discussing that work now, partly because the thirty years passed some time ago and partly because OLIC no longer exists. I’m not sure exactly what happened to it, but I presume it got flogged off on the cheap when British Gas was privatized during the Thatcher regime. The main activity of the On-Line Inspection Centre was developing and exploiting techniques for inspecting gas pipelines for various forms of faults. The UK’s gas transmission network comprises thousands of kilometres of pipelines, made from steel in sections joined together by seam welds. I always thought of it as like a road network: the motorways which were made of 36″ diameter pipes; the A-roads were of smaller, 24″, diameter; and the minor roads were generally made of 12″ pipes. It’s interesting that despite the many failings of my memory now that I’ve reached middle age, I can still remember the names of some of the routes: “Huddersfield to Hopton Top” and “Seabank to Frampton Cotterell” spring immediately to mind. Anyway, as part of the Mathematics Group at OLIC my job was to work on algorithms to analyse data from various magnetic inspection vehicles. These vehicles – known as “pigs” – were of different sizes to fit snugly in the various pipes. The term “pig” had originally been applied to simple devices used to clean the gunk from inside of a pipe. They were just put in one end of the line and gas pressure would push them all the way to the other end, often tens of kilometres away. The pipeline could thus be cleaned without taking it out of service. The two sets of magnets are connected to the pipe wall by steel brushes to maintain good contact. The magnetic field applied by the front set of magnets is contained within the pipe wall forms a kind of circuit with the rear set as shown, unless there is a variation in the thickness of the material. 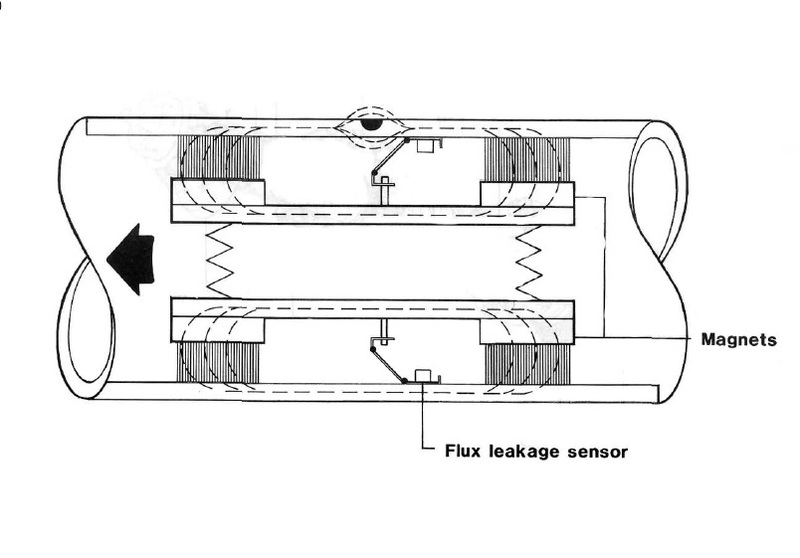 In that case magnetic flux leaks out and is detected by the sensors. The magnets and sensors are deployed in rings to cover the whole circumference of the pipe. 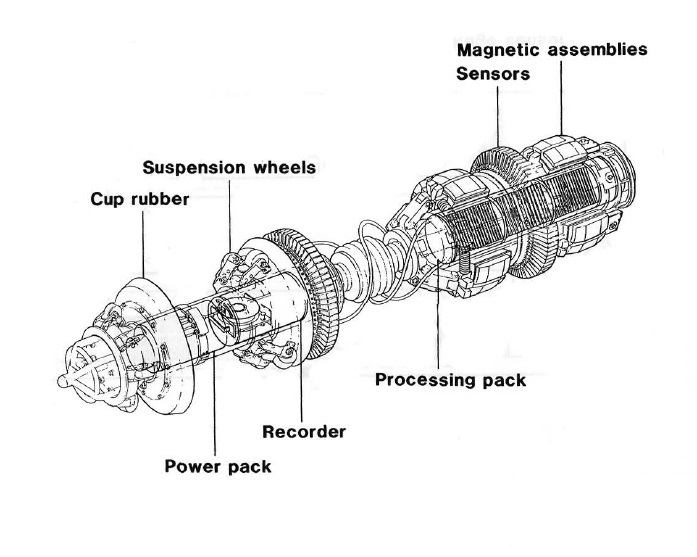 A 24″ diameter pig would have 240 sensors, each recorded as a separate channel on the vehicle. The actual system is fairly complicated so some of the work was experimental. Sections of pipe were made with defects of various sizes machined into them. The pig would then be pulled through these sections and the signals studied to build up an understanding of how the magnetic field would respond in different situations. I always thought they looked a bit like spacecraft. The pig usually travels at something like walking pace along the pipeline, and the sampling rate of the sensors was such that a reading would be taken every few millimetres. That sampling rate was necessary because corrosion pits as small as 1cm across could be dangerous. The larger vehicles had “on-board thresholding” so that recordings of quiescent sections were discarded. Even so pipe surfaces (especially those of smaller bore) could be uneven for various reasons to do with their production rather than the effects of corrosion. Moreover, every few metres there would be a circumferential seam weld where two sections of pipe were joined together; these features would produce a large signal on all channels which the thresholding algorithm did not suppress. The net result was that a lot of data had to be stored on the vehicle. When I say “a lot”, I mean for that time. A full run might produce about 5 × 107 readings. That seems like nothing now, but it was “Big Data” in those days! So how was all this data processed back at the station? You probably won’t believe this, but it was printed out on Versatec printers in the form of a chart recording for each channel. Operators then identified funny-looking signals by eye and we then pulled down the data from tape and had a further look, usually comparing the patterns visually with those obtained from “pull-through” experiments. Among the things I worked on was an algorithm to recognize seam weld signals automatically. That was quite easy actually – because it just requires looking for simultaneous activity on all channels – although it had to be made robust enough to deal with the odd dead channel and other instrumental glitches. This algorithm proved to be useful because sometimes the on-board telemetry would go wrong and we had to locate the pig by counting the number of welds it had passed since the start of the run. A far more difficult challenge was dealing with data from 12″ diameter pipe. These are manufactured in a way that’s completely different from that used to make pipes of larger diameter, which are made of rolled steel. The 12″ pipes were made from a solid plug of molten steel, the centre of which is bored out by a device that rotates as it goes along. The effect of this is that it imposes a peculiar form of variation on the pipe wall, in the form of a spirally modulated “noise”. Annoyingly, the pitch and amplitude of the spiral varied from one section of pipe to another. After many failed attempts, the group finally came up with an algorithm that used the weld detector as a starting point to establish the vehicle had entered a new section of pipe. It then used data from the start of each section to estimate the parameters of the spiral pattern for that section, and then applied a filter to remove it from the rest of the section. It wasn’t particularly elegant, but it certainly cleaned up the data massively and made it much easier to spot significant features. You might ask why I’ve written at such length about this when it’s got nothing to do with my current research (or indeed, anything else I’ve done since I graduated from Cambridge in 1985). One reason is that, although I didn’t know it at the time, my time at OLIC was going to prepare me very well for when I started my PhD. That was the case because all the programming I did used VAX computers, which turned out to be the computers used by STARLINK. When I started my life as a research student I was already fluent in the command language (DCL) as well as the database software DATATRIEVE, which was a great advantage. Another reason is that working in this environment I had to learn to make my code (which, incidentally, was all in Fortran-77) conform to various very strict standards. I didn’t like some of the things we were forced to do, but I was shouted at sufficiently often that I gave up and did what I was told. I have never been particularly good at doing that in general, but in the context of software it is a lesson I’m glad I learned. Above all, though, I think working outside academia gave me a different perspective on research. As academics were are very lucky to be able- at least some of the time – to choose our own research problems, but I believe that in the long run it can be very for your intellectual development to do something completely different every now and then. We’re currently discussing a scheme whereby Physics and Astrophysics research students can interrupt their PhD for up to 6 months to undertake a (paid) work placement outside academia. I suspect many graduate students will not be keen on this, as they’ll see it as a distraction from their PhD topic, but I think it has many potential advantages as I hope I’ve explained. Incidentally, Beaumont-Hamel had seen fighting since the very first day of the Battle of the Somme. On July 1st 1916, 700 men of the Newfoundland Regiment gave their lives there as they went “over the top” and were promptly mown down by machine guns. There is an important memorial to their sacrifice there. The statistics of the Somme Offensive are truly horrific. In total well over a million men were killed or seriously wounded during the 141 day campaign. By the time it finished the British, French and Commonwealth armies had advanced a maximum of about 6 miles. Most historians describe the outcome as “inconclusive”, largely on the grounds equal numbers of soldiers were slaughtered on each side. It was a stalemate, but the price paid in blood was appalling. The carnage didn’t end with the Somme. As the “Great War” stumbled on, battle after battle degenerated into bloody fiasco. 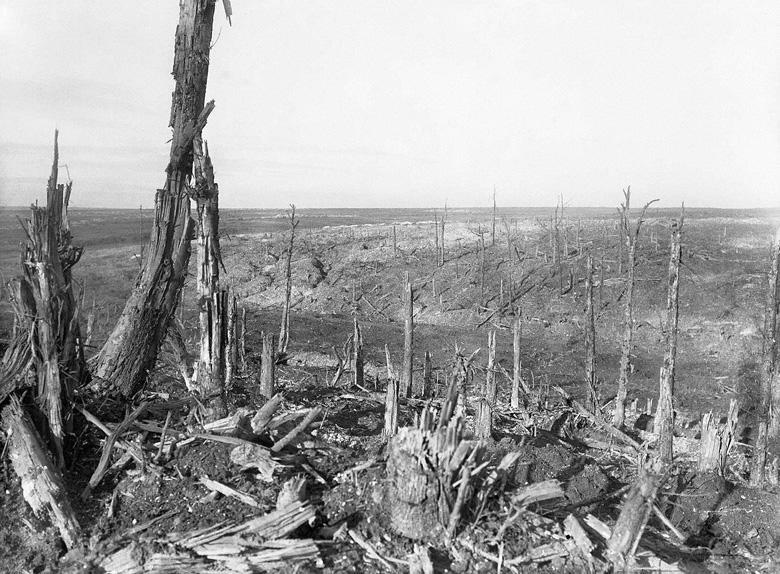 Just a year later the Third Battle of Ypres saw another 310,000 dead on the British side as another major assault on the German defences faltered in the mud of Passchendaele. By the end of the War on 11th November 1918, losses on both sides were counted in millions.